There has been a lot of talk this week about hacker Alexy V. Borodin (who goes by the handle ZonD80) who put up a service that facilitated illicit transactions of IAP (in-app purchase) content from iOS apps. While identifying security problems with the way IAP transactions work, it also underlined the need for developers to be diligent in secure practices with their apps. The exploit requires users to first install two certificates on their iOS device: an SSL certificate for Alexy’s “fake App Store” and a certificate to trust the CA that signed that SSL certificate. Once this is done, the user changes their DNS settings to point to Alexy’s DNS servers. Now when an IAP request is made, instead of talking to Apple’s servers, the user’s device is talking to Alexy’s, and instead of being charged then given a valid receipt, the user is not charged and Alexy’s server simply hands back the receipt it has cached. As far as the app on the user’s device is concerned, the user has paid for the IAP content and the app received a receipt from Apple verifying this. There are two problems (as far as I can tell) with Apple’s current implementation that allow this to happen. The first issue is that a user can trust 3rd party certificates for in-app purchases. If StoreKit had been locked down to only trust Apple’s certificates for this type of traffic, then the receipt likely never could have been sniffed and cached by Alexy in the first place. Even if he had acquired them somehow, users would be unable to install his SSL and CA certificates that are required to perform the fake transactions. However, since users have (and in many legitimate cases need) the ability to install 3rd party, untrusted certificates in iOS, I don’t know if it’s possible for StoreKit to ignore the OS-wide certificate list, and only use its own provided by Apple. The second problem with Apple’s implementation (as pointed out by Alexy) is that the receipts have no uniquely identifying information. The receipts aren’t tied to any particular device or Apple ID. This means that only one person ever has to buy the IAP content, but they can then share that receipt with others who can re-use it to fool apps on their devices into thinking they paid for the content. If Apple were to only fix this part of the problem by having apps check that the receipt belonged to the current device, it would still leave the potential for users to recycle their own receipts over and over. For example, if a user were playing Angry Birds and decided to buy the $0.99 IAP for 20 Space Eagles, they could capture the receipt from the transaction, then re-use it on subsequent transactions for the same in-app purchase. 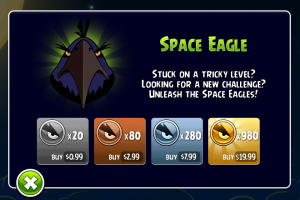 So by paying $0.99 one time, they could acquire unlimited Space Eagle in-app purchases. All of this boils down to the fact that we have a very broken in-app purchase system right now, so how do we fix it? The bad news is, we really can’t; Apple has to. Signs already point to Apple taking measures to fix the system. They’ve started including a unique identifier in App Store receipts, which apps could potentially (with an update) use to validate that the receipt does actually belong to that device. I’m not sure if they have any plans to lock down StoreKit to make sure it only ever talks to Apple. While developers can’t fix this broken system, there are steps that can be taken to minimize the risk involved. In fact, developers who follow Apple’s instructions on validating receipts against their own servers seem to be unaffected so far. When this story first broke it was thought that developers who were validating receipts against their own servers were immune, which isn’t quite true. Receipts validated against developer servers can be forged in the exact same way. Anybody can capture the response from the developer’s server that occurs during the validation, and then reuse it. However, to my knowledge, this isn’t currently being done. While it’s not a solution, it does provide one more hoop to go through for people to steal IAP content; a hoop which Alexy doesn’t seem to be jumping through as evidenced by the large number of users on his website who complain about apps with which his service does not work. It looks like Alexy may soon offer the same circumvention services for Mac App Store apps (then again, maybe not). Apple has been making efforts this week to minimize the damage done by Alexy’s service, will surely have a complete solution available shortly, and are hopefully already ahead of him with the Mac App Store and working on a solution there as well. In the meantime, developers should at least make sure they’re validating receipts agains their own servers, and if they can’t, look into a 3rd-party solution like Beeblex.